Gillian's Island | Just another fashion blog from a Second Life fashion fan. There's really no island here. Though mountains may topple and tilt. You’ll never go wrong with a pig! If you’ve got some SL years behind you like I do, you’ll remember LavanadaChic, maker and purveyor of fine SL fashion. Well….they are back!! The new store is open and there is a brand new fashion collection on the racks. I’ve got a couple of outfits here for you to look at, both with brand new items from the new LavanadaChic. Make sure to try a demo before you buy, and be sure you hop upstairs to the outlet section. Prior LC garments at crazy prices…and still so pretty! 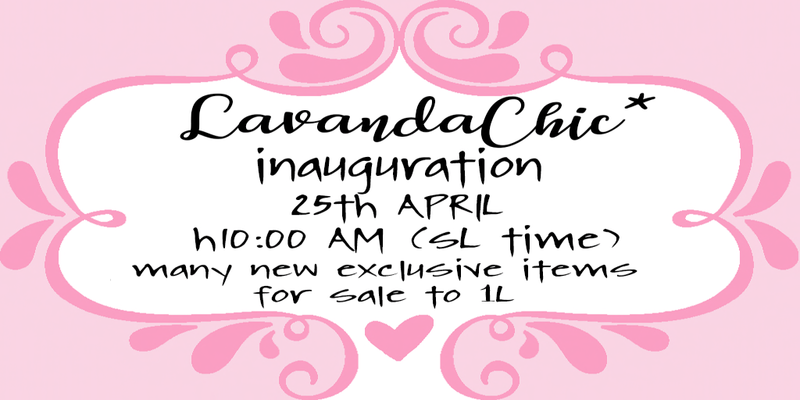 As I mentioned, LavanadaChic is open now and the official grand opening celebration will be held on 25th April starting at 10:00AM SLT. Many new and exclusive items will be for sale for only 1L that will be prepared especially for the grand opening. Outfit details are below. Welcome back, uklea! Welcome back, LavanadaChic! LavandaChic* is back on the grid with a beautiful new fashion collection! In my next post, I’ll be featuring three lovely outfits from the new collection. In the meantime, LavandaChic* is open for your shopping pleasure. And be sure to mark the following info on your calendar for a grand opening celebration! Spring morning bursting with new spring life. Enjoy your day and your weekend! amara beauty Jasmine fair – GENUS applier at Flourish Sales Studio! a new sales event that will run every other month and offers discounted items priced between 70L – 99L! I’ve always wanted to smash a guitar over someone’s head. You just can’t do that with a piano. I’m frolicking in the jungle with a crazy piano. All my details follow.